I stopped referring to the laserdisc that day because it was clear a specific form of media wasn’t just obsolete, but unknown to a whole generation of film fans. There was also the day someone said this: ‘I’m looking for this really, REALLY old film that came out a long time ago. It’s old school, so I don’t know if you have it, but I’m looking for it.’ Never mind I dislike the term “old school” (it’s a notch below that meaningless term “back in the day”). The ‘really, REALLY old film’ ended up being something from 10 or 15 years ago by a known director with known stars that did not die a few years later from natural causes. This was another indicator that movies, for some, have no temporal context; it’s like overdosing on 5-7 movies during a film festival, after which the content and its meaning all blur, except this blurring in ongoing. There’s also the ingestion of movies from venues that seem to lack a meaningful relationship: in place of a classic movie palace or the local cinema hangout, streaming and binge-watching from online sources are the norm, both of which add to this fuzzing of context that to an older generation may seem awry. One final thought about the subjectivity of things old: Rod Serling’s Patterns, a teleplay from 1955, may be old to someone who watched it live on TV, but it’s fresh to a kid (me) who caught on TV – knowing it was old, but not ‘really, REALLY old’ to the extent it’s covered in active mold and sprouting a seeded tree root. It’s an acknowledged artifact from the golden era of live television, surviving as a kinescope, and for some, it’s steeped in nostalgia, and a portal to a wealth of TV and pop culture history that’s fresh to a newcomer. He didn’t really sound that young on the phone, but this was another signpost that physical media was continuing its journey from something of importance to irrelevance among many. Whether it’s LP collectors, connoisseurs of cassette tapes, fans of Super 8 movie reductions, CDs or whatever, physical seems to have been pushed to the nosebleed section of niche formats. Rewind This! is ostensibly a documentary about VHS collecting, but the subject is so heavily contextualized in the doc and more so in the extras gallery (identical on both the DVD and digital download) that the film is a snapshot of an industry’s rise, its often idiotic conflicts and stumbles, and videotape’s cultural impact as an early medium to own major Hollywood films, TV shows, and specialty back catalogue titles. Also noted in the doc is the social experience of renting movies from a bricks & mortar store, often as a group effort, punctuated by a social experience of movies + food + drink + wisecracks. The group activity is historically rooted in heading out to a cinema, if not a music concert, play, musical, concert, etc., but as video stores in small and major urban centres have almost disappeared, the group activity of watching movies at home with a pack of friends has flipped back to its more formal and traditional roots in cinemas. Home video and the home viewing experience seems to have evolved into a private activity, often done solo, with couples, or isolated to family members and close friends. 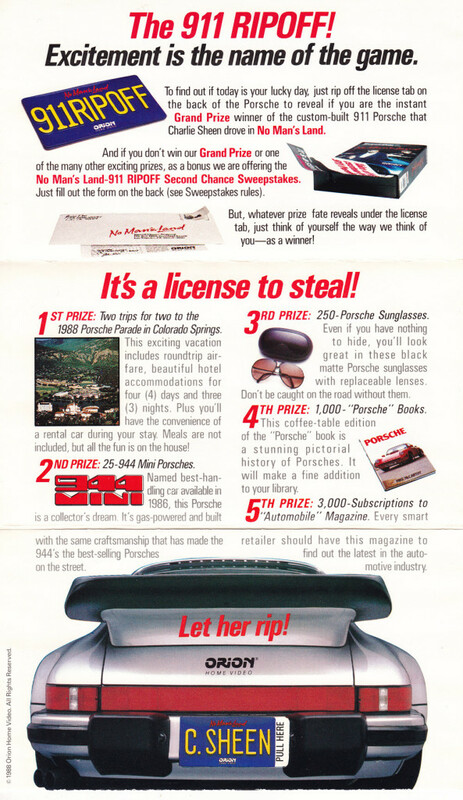 The doc’s filmmakers – themselves avid tape collectors and film fans – pay tribute to the astute businessmen and businesswomen who made smarter decisions than the studios, recognizing the opportunities to sell and disseminate genre productions in indie and major video chains which were initially (or sometimes perpetually) regarded by the studios with contempt because their profits did not include any rental income. The doc’s biggest impression isn’t about the validity of collecting VHS (or Betamax) tapes, nor tape’s massive impact in how we came to digest movies, nor how the studios found an income bonanza from old movies that had previously gotten exposure from late night TV airings; it’s the open-ended question of whether the coming generations of film fans will have nostalgia for their favourite films, and how it’ll be experienced and expressed. One can argue that as music and movies became available en masse to buy and rent, nostalgia was, to more than any prior generation, tied to a physical object, and the interviewed collectors as well as filmmakers clearly believe in building their own personal library or film archive. 2 — Physical media repeatedly draws us back to its content. A glance, a perusal, a literal weighing of the object can determine ‘What should I watch next?’ or haven’t seen in ages. 3 — Stuff looks good when organized into a mega-wall or over interconnected bookcases. Like posters, ornaments, nick-knacks, pottery, toys, etc., they’re decorative, conversation pieces, and offer comfort and inspiration to some. A photograph, for example, might remind you ‘Nature is a beautiful thing,’ or that shot of your city as seen through the eyes of a curious photographer reinforces the city where you live is really the best place on Earth, and never to take its virtues for granted. Transfer that to a movie poster or a wall of zombie movies, and the relationship isn’t any different. The open-ended question of whether nostalgia is still relevant splinters into several quandaries when Evan Husney of Drafthouse Films says “People who still buy music more often then not are more comfortable not owning it,” and it’s that comfort in simply digesting, perhaps retaining a digital copy, and never having the need for an object to experience nostalgia that’s is so baffling. To some. If the course among the masses of future film fans is to never retain even a small personal library of their favourite films – from their childhood, youth, and adulthood – then how will filmic nostalgia, as we know it, be experienced? What will be someone’s relationship with a group of films 20 years from now when that which existed online has been deleted because of rights issues? Will there be a natural urge to preserve aspects of one’s taste and personality even as digital media, and can the personal satisfaction be on par with a wall of tapes, DVDs, and Blu-rays, especially if it’s surviving form is as a file among many organized into folders on a hard drive or cloud? 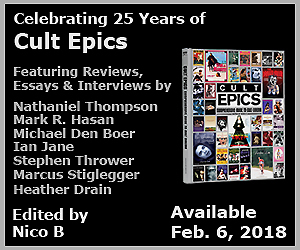 I like the comments by Synapse Films‘ Don May regarding his company’s commitment to meeting the needs of fans wanting their nostalgic trip or collectible film in its best possible form with all the trimmings and archival minutia (begun by pioneers like Criterion), featuring commentary tracks, stills, featurettes, interviews, and isolated score tracks. You see the same commitment in other indie labels because they’re run by film fans / collectors / filmmakers who still see value in physical media. They’re also determined to put on record interviews and production archives before they vanish and a film loses relevance with a new generation. The studios’ MOD programme works with its premium pricing because they finally get to earn the last dollar on a home video release: an MOD is a custom-made DVD-R that’s sent to the door of said film fan – but at a premium price tag far higher than catalogue and sell-through. The MOD discs meet the need of those wanting either one or many rare films which perhaps don’t exist anywhere else, or are preferred as studio-made in place of a copy taped off TCM and burned to disc. (Note how I left in the word “taped” which, like “dialing a phone number” and “rewinding a tape” refers to a defunct action and obsolete technology. I say “tape” but maybe its contemporary replacement is simply “record” which bears no relation to any specific form of media. Another interview segment likely to be appreciated by film fans is critic James Rocchi‘s comments on that thing which everyone agrees is nonsense: the Disney Vault, and the “vault” term that’s been appropriated by other studios for their MOD productions. Disney’s titles aren’t ‘manufactured on demand’ but taken in and out of circulation because it supposedly ensures you’ll miss it again, and want to re-buy it again. When their films eventually fall into public domain, I wonder how they’ll try and re-sell their classic films. “It’s a completely artificial sense of scarcity designed to create a completely artificial sense of demand,” says Rocchi, which is a concept that works only for something physical. Or can “limited” and “vault” still apply to a ‘limited digital streaming of a movie from the Disney vault’? If you know where to look, there’s no shortage of films in assorted formats available new, old, or as archived files, but the doc’s second most important point is the loss of film, and especially home video history, if there’s no migration of films to a digital domain. Collecting tapes isn’t any different than LPs because there’s that small fear where that which you own and hold in your hands may no longer be available. Not all filmmakers know where their prints are, let alone their condition. The fear in losing a chunk of film history’s real, but is it relevant just to those who care? The recent passing of Mike Vraney (who appears in Rewind This!) shows the interest and concerns of one person does reach beyond just a few genre connoisseurs, because Something Weird Video did rescue a chunk of exploitation history, and by putting those works on tape and later disc, showed a lot of people a genre which no one dreamed was so rich. SWV’s release slate did eventually slow down – perhaps he had exhausted his supply, rights holders became fickle, or sales had plateau’d – but the end goal of getting the movies from dusty film cans to homes was fully accomplished. So yes, the interest and seriousness of one person can make a difference, rescue lost works, and influence future filmmakers, if not create a new fan base for a genre. The same certainly applies to connoisseurs of trash, schlock, sexploitation, lesser budgeted kung fu, shot-on-video shockers, and so on. They may not affect the average filmgoer’s own home video and online digestion, but it’s not unusual to hear an artist say a key influence was a long forgotten work, or even something of absolute banality. After watching a documentary about people watching films on VHS – by choice, or lack of a proper widescreen DVD or Blu-ray edition – I thought it would be fun to sit down and watch one of the videos I bought on tape because it only existed as a full screen DVD, and the Beta tape was $1.00. When a nearby store phased out their Beta tapes, the sale prices were less than blank stock. 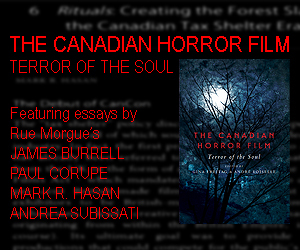 At the time I thought buying Beta tapes was an exceptionally odd choice since film fans now had laserdisc & DVD, but as many connoisseurs of CanCon know, a lot of Canada’s film history is only accessible via old tapes or the odd TV broadcast. In terms of DVD or Blu-ray releases, only Americans care enough to rescue our classics from rot or obscurity. We generally have to import our classics and exceptional schlock because Criterion, Lionsgate, Scorpion Releasing, and Synapse Films are among the handful of labels that see value in what no one up here’s willing to gamble. Getting back to The Personal Test, I’d bought some $1 Beta titles from Ebay last year because I noticed quite a few were not available on disc, and while No Man’s Land was on DVD full screen, why pay $15 when $1 gets you an artifact, and fatter analogue audio to relish Basil Poledouris’ pulsing electronic score? Watching the tape required a little re-patching: Betamax out to DVD recorder in; DVD recorder upscales the Beta II recording to HDMI; endpoint: HD monitor. It actually didn’t look awful, but that may be because I’m accustomed to using both HD but mostly SD vintage cameras for my short films and arty-farty projects, so I’m used to the look of lo-fi video with visible signal noise, but I was also curious to hear how the sound mix came off via SuperBeta HiFi, as piped through a vintage Pioneer Pro Logic amplifier. The audio was fine up until the End Credits when the overmodulated music was bleeding into the red zone and distorting a little, but these things can happen when it’s tape. Laserdisc was always a step up, and that Pro Logic mix which accompanied Criterion’s Se7en set is one of the best. One can even toss in the old Image laser for Suspiria (1977) which blows away the 5.1 mix created for Anchor Bay’s DVD. A CanCon classique! Toronto doubling for NYC! Robert Vaughn + Kerrie Keane + John Vernon + Leslie Nielsen! In any event, it was a little fun to play a tape on the same Sony model I used for years to tape TV series in stereo, and I did hold on to a few tapes when I moved. The No Man’s Land case was built for VHS, but inside is an adapter that made those cardboard sleeves usable for Beta tapes. This adapter isn’t earth-shattering or visually unique – it’s a piece of molded cardboard – and I felt what better way to have fun with something so banal than to make a vintage-styled promo short. 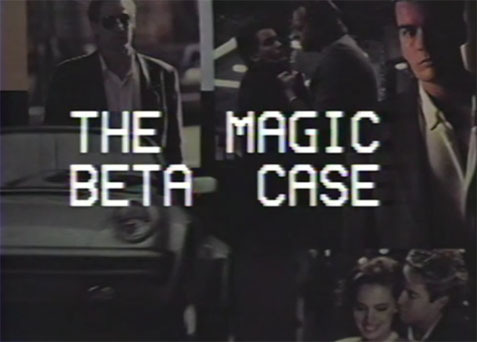 The Magic Beta Case was filmed using a 1985 Panasonic WV-6000 S1 tube camera (this industrial model has 3 Newvicon tubes), recorded straight to VHS, dumped to the hard drive, and edited in Adobe Premiere. Besides dissolves, there are no digital effects nor any colour correction, and the text used for the Main & End Credits were generated by the camera. Hopefully it looks and sounds like an authentic banality from 1988, as done by a small local outfit. Click to read the "No Man's Land" contest details! 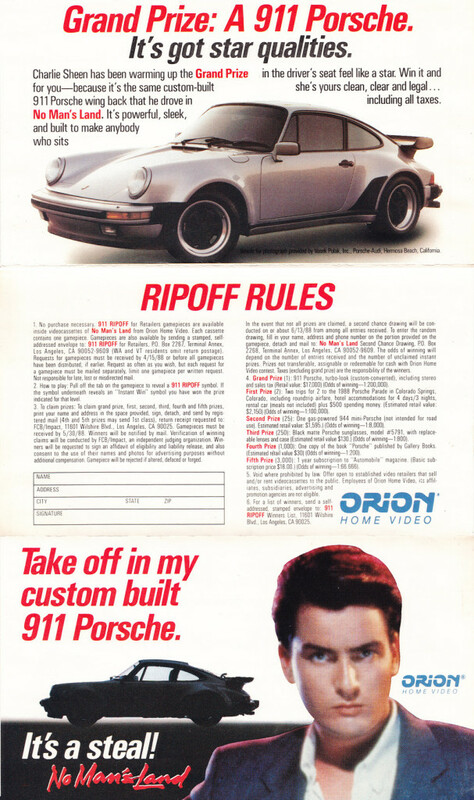 Charlie Sheen wants you to take off! And lastly, while I’ll provide a blog tied to my review of Severin’s House on Straw Hill Blu-ray, I’ve already uploaded a review of David Gregory’s excellent doc Ban the Sadist Videos! (2005) which was included with the first 3000 copies of Straw Hill. It’s an excellent doc on Britain’s infamous Video Nasty era, and is related to collectors who seek out the original videotape releases of subsequently banned films, and their now celebrated, lurid cover art.